As Boulder struggles with different strategies for addressing the twin challenges of global climate change and local growth, it might be interesting to consider one solution that’s here today: the Electric Vehicle. Buried under a recent Daily Camera headline and story about Longmont was the only Camera mention of Boulder’s first-in-the-state National Drive Electric Week local event on September 17. Too bad the Camera didn’t cover a fantastic local volunteer event co-located at Wednesday’s Farmer’s Market. Local electric vehicle drivers brought 14 different vehicles for display, ranging from the Chevy Volt and the Nissan Leaf to three Teslas. Boulder Nissan and other dealerships provided cars for test drives. The event drew community thought leaders in carbon reduction including Will Toor and Macon Cowles and it drew many Boulder residents who are seriously considering the purchase of an electric vehicle and were happy to meet with knowledgeable EV drivers without any sales agenda. Among the sponsors of the event was my organization, EV Owners of Colorado, a non-profit representing a growing number of the more than 3,000 EV drivers in Colorado. The purpose of the group is to aggregate the voice of EV owners and like-minded friends to persuade government entities, business and property owners and the general public to invest in EV support infrastructure like more charging stations. It seems like many of these are high value targets for EV charging that could make a dent in carbon emissions. Research shows that providing workplace charging facilities influences car-buying behavior. My Chevy Volt, even with gas backup, cuts two-thirds of my annual carbon emission. Further, it runs off electricity in my home that in turn is part of the WindSource wind energy program. 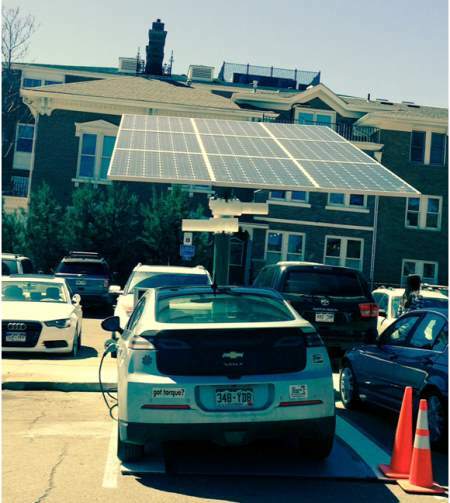 Downtown, I can charge my car in a muni lot powered by a solar panel (see photo). EVs won’t get cars off the road, but will at least make them cleaner until we figure out the growth challenge. Can Boulder Reduce Its GHG Emissions by 80%?